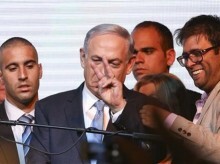 TEL AVIV, Israel — Israeli Prime Minister Benjamin Netanyahu’s ruling Likud Party scored a resounding victory in the country’s election, final results showed Wednesday, a stunning turnaround after a tight race that had put his lengthy rule in jeopardy. With nearly all votes counted, Likud appeared to have earned 30 of parliament’s 120 seats and was in a position to build with relative ease a coalition government with its nationalist, religious and ultra-Orthodox Jewish allies. Such a government would likely put Israel at odds with the international community over settlement construction and its opposition to Palestinian statehood, and continue clashing with the White House over hard-line policies. The election was widely seen as a referendum on Netanyahu, who has governed the country for the past six years. The victory was a stunning turnabout from the last pre-election polls published Friday, which showed the opposition Zionist Union, led by Isaac Herzog, with a four- or five-seat lead and building momentum, and the Likud polling close to 20 seats. To bridge the gap, Netanyahu embarked on a last-minute scorched-earth campaign, promising that no Palestinian state would be established as long as he remained in office and insulting Arab citizens. Zionist Union wound up with just 24 seats. Given the final results, it is all but assured that Israel’s largely ceremonial President Reuven Rivlin will task Netanyahu with forming a new government. Netanyahu says he hopes to do so quickly, within two to three weeks. Netanyahu focused his campaign primarily on security issues, while his opponents instead pledged to address the country’s high cost of living and accused the leader of being out of touch with everyday people. Netanyahu will likely look to battle that image now by adding to his government Moshe Kahlon, whose upstart Kulanu party captured 10 seats with a campaign focused almost entirely on bread-and-butter economic issues. Kahlon is expected to become the country’s next finance minister. A union of four largely Arab-backed factions became Israel’s third largest party — with 14 seats — and gave Israel’s Arab minority significant leverage in parliament for the first time. Ten parties in all made it into parliament. Herzog, who appeared poised only days ago to stage a coup, conceded defeat, saying he called Netanyahu and offered him congratulations. He signalled that he would not join forces with Netanyahu and would rather head to the opposition. “I think that at this moment what Israel needs most of all is another voice, a voice that offers an alternative and a voice that tells it the truth,” he said outside his Tel Aviv home. Netanyahu’s return to power for a fourth term likely spells trouble for Mideast peace efforts and could further escalate tensions with the United States. Netanyahu, who already has a testy relationship with President Barack Obama, took a sharp turn to the right in the final days of the campaign, staking out a series of hard-line positions that will put him on a collision course with much of the international community. The Palestinians, fed up after years of deadlock with Netanyahu, are now likely to press ahead with their attempts to bring war crimes charges against Israel in the International Criminal Court. Renewed violence could also loom. The international community overwhelmingly supports the establishment of a Palestinian state in the West Bank, east Jerusalem and Gaza Strip, areas captured by Israel in 1967, and opposes settlement construction. With the race close, Netanyahu reneged on his previous stated support for a Palestinian state in an attempt to shore up his hawkish base in a frenzied last day of campaigning. Netanyahu also infuriated the White House early this month when he delivered a speech to U.S. Congress criticizing an emerging nuclear deal with Iran. The speech was arranged with Republican leaders and not co-ordinated with the White House ahead of time. Reaching a two-state solution to the Palestinian conflict has been a top foreign policy priority for President Obama as well. In Washington, White House spokesman Josh Earnest said Obama was confident strong U.S.-Israeli ties would endure far beyond the election, regardless of the victor. Throughout the campaign, Netanyahu portrayed himself as the only politician capable of confronting Israel’s numerous security challenges. Avi Degani, president of the Geocartography polling institute who had predicted an outright Likud victory, said ultimately Netanyahu’s experience prevailed. “There was a situation where many people wanted to replace him but there was no one whom they wanted to replace him with,” he said.